WILLEMSTAD - The Public Prosecution Service can start with an attachment of 1.8 million guilders from Gerrit Schotte. This is according to the spokesperson for the Public Prosecutor Norman Serphos. The Public Prosecution started a confiscation case against the former prime minister and his partner Cicely van der Dijs. This in response to the conviction for official bribery, money laundering and forgery. The case against Van der Dijs was rejected, but Schotte was ordered to pay back the illegally obtained funds. The Public Prosecution could now seize, for example, goods or invoices worth 1.8 million. However, they do not yet have the right to collect the items or invoices: this is only possible if the judgment is irrevocable, this means after an assessment of the cassation court. 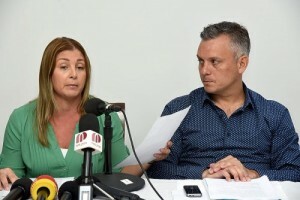 "The accounts or items would be frozen, so to speak, so Schotte himself cannot use them anymore,” according to Serphos. Whether or not the Public Prosecution is already confiscating accounts or items belonging to the former Prime Minister, Serphos did not say.